President Trump has said he is scrapping two business councils after more bosses quit over his handling of violent clashes in Virginia. The clashes culminated in a woman's death and nearly 20 wounded when a car ploughed into a crowd of anti-fascists. Mr Trump's reaction has sparked outrage and generated global headlines. His announcement on Twitter came as the heads of 3M, Campbell Soup, Johnson & Johnson and United Technologies announced their resignations on Wednesday. Mr Trump said: "Rather than putting pressure on the businesspeople of the Manufacturing Council & Strategy & Policy Forum, I am ending both." Before Mr Trump's announcement, the Strategy and Policy Forum announced it was a joint decision to disband the council. Businesses have been under pressure to distance themselves from Mr Trump over his handling of the clashes in Charlottesville, Virginia. On Monday, Mr Trump belatedly condemned the white supremacist and neo-Nazi groups that rallied in a small Virginia town on Sunday. 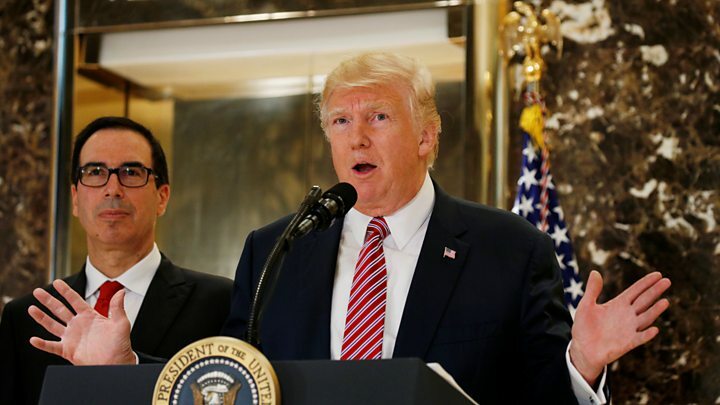 But in a rancorous news conference on Tuesday he backtracked and again blamed left-wing counter-protesters for the violence too. JPMorgan CEO Jamie Dimon, a member of the Strategy and Policy Forum, released a separate statement on Wednesday saying he strongly disagreed with Mr Trump's recent statements, adding that "fanning divisiveness is not the answer". "Constructive economic and regulatory policies are not enough and will not matter if we do not address the divisions in our country. It is a leader's role, in business or government, to bring people together, not tear them apart," he said. Denise Morrison of Campbell Soup Co said she could not continue to participate in the advisory panel after Mr Trump's comments. Activists had called on Campbell Soup, among other firms, to take action. Is this a sign Trump is in trouble? After the Charlottesville violence, Ken Frazier of Merck abandoned the president's manufacturing council and quickly drew the president's Twitter ire. At that point there was some media speculation - through unnamed "corporate leaders" - that the wise move would be to wait out the storm rather than pick a fight with the president. Companies like Boeing and General Motors had tangled with the president in the past, and they (and their stock prices) generally ended up the worse for it. This time was different. As more corporate chiefs headed to the exit, the riskier move - from a business as well as political perspective - became staying put. The president, despite further tweets and verbal swipes, was unable to staunch the bleeding. His rhetorical gymnastics on the Charlottesville situation only made matters worse. In the corporate world, there's always talk of "leading indicators" - tell-tale signs that help predict what's to come. Why were President Trump's remarks so controversial? 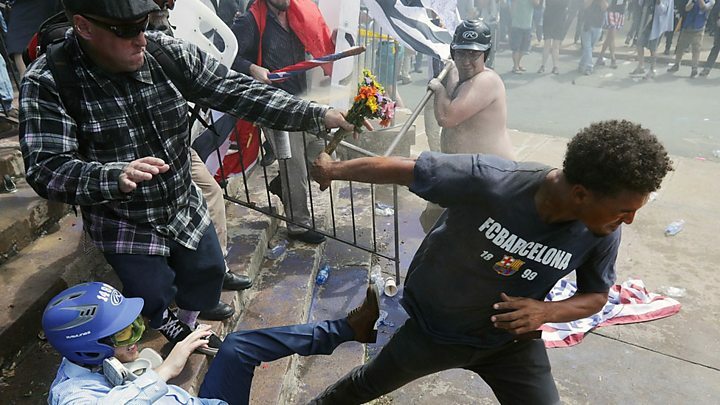 The president was under pressure to explicitly condemn white supremacists who were behind Saturday's far-right rally, where violent clashes left a woman dead and nearly 20 people injured. The rally, supported by neo-Nazis and white supremacists, was in protest of the removal of a statue of Robert E Lee, a general who had fought for the pro-slavery Confederacy during the US Civil War. But Mr Trump reversed course on Tuesday and instead appeared to defend the rally's organisers. He condemned the driver of the car who rammed into a crowd of counter protesters and killed a woman, but said those who had marched in defence of the statue had included "many fine people". Mr Trump's remarks were welcomed by David Duke, a former leader of the Ku Klux Klan. What else happened on Wednesday? At a memorial service in Charlottesville for Heather Heyer, who was killed in the weekend clashes, her mother delivered a powerful message. 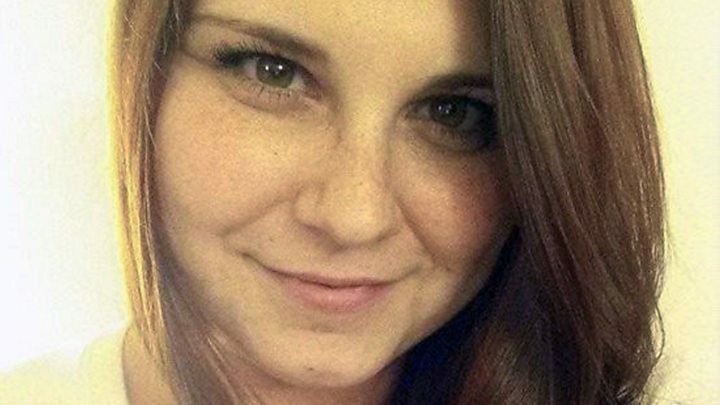 Attorney General Jeff Sessions, who has faced accusations of racism in the past, said the government may press hate crime charges against the man accused of driving his car and killing Ms Heyer. Speaking in Miami about undocumented immigration, he said: "In no way can we accept or apologise for racism, bigotry, hatred, violence, and those kind of things that too often arise in our county". Vice-President Mike Pence, who has been on a diplomatic tour of South America, said he was cutting his trip short to return to the US after a visit to Panama. He told reporters travelling with him that he stands by Mr Trump's words. Former CIA director John Brennan said in a letter to CNN that Mr Trump's words are "despicable", "dangerous" and "a national disgrace". He added that "we will not allow the few to divide the many". Two Republican ex-presidents also weighed in. In remarks implicitly critical of President Trump, George HW Bush and son George W Bush called on the US to "reject racial bigotry, anti-Semitism and hatred in all forms". Their joint statement adds to a growing chorus of Republicans condemning Mr Trump's opinions on race.